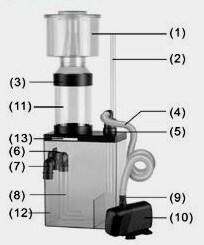 Foot Print (L x W x H) 8" x 5" x 10"
Diameter of outlet tube Ø 1"
Adapter size of inlet Ø½", ¾"
What is a PROTEIN SKIMMER and its function? A protein skimmer is a mechanical device that removes dissolved organic compounds and particles from the water by separating foam which is created by the mixing of air and salt water. The dissolved organic compounds and particles make up the ammonia, nitrite, nitrate, color, turbidity, odor, B.O.D, phosphate, taste, etc in the aquarium water. 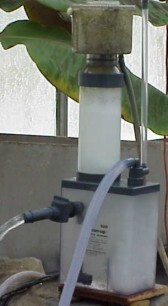 Protein skimming will remove the following pollutants from the water that are not normally removed by other forms of filtration: food particles, feces, dissolved organic material, free floating algae, silica, amino acids, phosphate, hydrocarbons, ammonia, nitrite, nitrate, carbonates bicarbonates, dyes, enzymes, detergents, iodine, some of metal ions, protozoa, and bacteria. It lowers pollutant concentrations before they break down into ammonia. Be aware, protein foam skimming also removes valuable trace elements and nutrients. However, protein foam skimming is one of the most important and useful methods to maintain a healthy environment for fish, invertebrates and coral. 3. Feed any suspended invertebrate food. Select the place where skimmer is put; In-sump or hang-on to the tank. Make sure the skimmer is securely installed before operating it. If the condition of skimmer is perfect operate skimmer continuously. Check the sump water lever. The water level of sump must be lower than outlet of the elbow, which is placed in the horizontal position for proper drainage. For OUTSIDE-SUMP installation - When sump space is limited install the skimmer in this manner. Stand Alone installation: The outlet of skimmer must be higher than the wall of the sump. 2. Grasp skimmer body with one hand and pull the waste collection cup straight up and out with the free hand. 3. Take out the waste collected in the collection cup and remove the debris by using a soft cloth or sponge to clean the cup under running water. 4. Replace the waste collection cup. Disconnect power cord before any cleaning. Remove the waste collection cup. Remove the skimmer from the tank or sump. 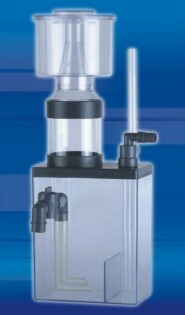 Take out water contained in the skimmer body. Clean the inside wall of skimmer body to remove debris or deposit by using a soft cloth or sponge with running water. Re-install the skimmer by reversing step. Make sure the skimmer is securely installed. If all are OK, operate skimmer. Check pump for possible overheating or electrical shortage. If pump is suspected of overheating or has an electrical short, discard the unit and use a new pump. Unplug the power cord and check the impeller for blockage by foreign objects. If blockage is present, clean impeller, shaft and impeller housing under running water. Reassemble impeller unit and place into pump. Re-plug the power cord and check for proper pump operation. Check the water outlet valve to ensure it is open. Check the bubble elimination sponge for clogs. If clogs are found, clean with running water and re-install for operation. 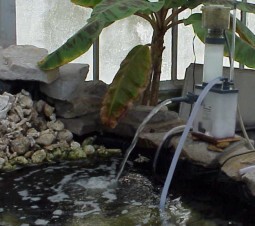 New skimmer is not skimming waste It is normal for a new skimmer set up. The proper dry foam that is needed to collect the protein in the salt water, will take approximately 12 to 34 hours to start skimming. If you have a new tank set up or you have just changed water in your tank, it may take longer. Do not worry about it. It is normal. It will take time about 12 hours to make proper foam skimming after installation newly. If there is not enough protein in the water, foam skimming will not perform well. This is normal. Copyright © 1998 Won Brothers, Inc. All rights reserved.